← Jewelry Warehouse Easter Egg Hunt! Have you seen our collection by Roma Designs? Stop by and see these beautiful pieces in person! The collection has artfully detailed scroll work which includes rings, pendants, bracelets and earrings. The collection also includes pieces in sterling silver, gold plated, as well as hints of sparkle with CZs. What we love about this collection: We adore the delicate filigree designs, giving it a vintage look and feel. These pieces look amazing for evening wear, but could also be worn to spruce up an outfit to wear to the office. 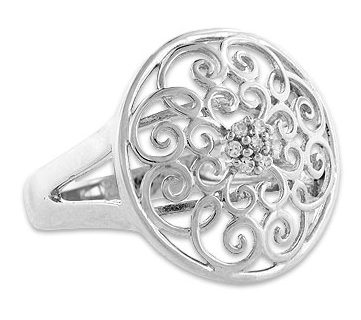 This ring pictured above is my favorite, as it reminds me of the Southern Gates collection we have. Information from Roma Designs: Our name, “Roma Designs”, comes from Rome, Italy (Roma) which is known as the “Eternal City”. With that thought in mind, we developed our product line. The right piece of silver jewelry, like Rome, will be eternal, and never just the latest fad. Our search for “eternal” silver designer jewelry takes us around the world. See some of these beautiful pieces below or see them on our website! This entry was posted in Jewelry, Jewelry Brands and tagged Jewelry, jewelry warehouse, roma designs, sterling silver. Bookmark the permalink.